1.1 How long does it take to make my leather product before it is shipped? 1.2 When are leather craft supplies shipped? 1.3 How long does shipping take? 1.4 How much does shipping cost? 1.5. Do you ship to countries other than United States & Canada? 1.6 How are items shipped? 1.7 Are there additional charges like custom fees or c.o.d.? 2.1 Can you custom make a leather product that is not in your web store? 2.2 Can you imprint a name in a leather product I already own? 2.3 The option combination I want is not shown for your leather product on the website. Can it be made? 3.1 How do I measure waist size for ordering a belt that comes with a buckle from Leathersmith Designs? 3.2 I want to order a belt but use my own buckle. How do I measure waist size? 3.3 Do your belts have snaps so I can use my own buckle? 3.4 How much adjustment will there be on my leather belt? 4.1 How do I measure neck size for my dog collar? 4.2 How much adjustment will there be on my leather dog collar? 5.1 Where is Leathersmith Designs Inc. located? 5.2 Can I come to your leather shop or is it just mail order? 5.3 What time zone are you in? 5.4 When are you open? 6.2 What currency are the prices shown for the website? 6.3 What currency is my credit card or paypal account charged? 7.1 Can I buy your dye to touch up my leather jacket or leather furniture? 7.2 How do I measure wrist size for my bracelet? 7.3 Are your products returnable? 7.4 How accurate are the colors shown on the website? 7.5 Quality of materials and craftsmanship? Q1.1 How long does it take to make my leather product before it is shipped? You must add the appropriate number of days to the delivery time/date displayed in your shipping choices to allow us time to make your leather product. Add approximately 3 days to the delivery time/date displayed to allow time for us to make your folding coin purses and spring frame coin purses. Add approximately 10 days to the delivery time/date displayed to allow time for us to make your guitar straps, belts, dog collars, leashes, wallets, other coin purses, belt pouches and wristbands. Add approximately 20 days to the delivery time/date to allow time for us to make your cellular cases, knife cases and iPhone cases. The above days shown for the average time to make are the normal amount of time. However if we receive an excessive amount of orders or during busy times or during holidays, leather products could take slightly longer to have made. Therefore if you have a deadline such as Christmas, a birthday or a vacation date, give us a call, send an email or write it in the order instructions/comments during the checkout process to let us know of your deadline. Q1.2 When are leather craft supplies shipped? You must add approximately 1 day to the delivery time/date displayed in your shipping choices to allow us time to package your leather craft supplies, hides, buckles, snaps, rivets, tools dyes etc. Q1.3 How long does shipping take? During the checkout procedure, you will be presented with various postal shipping options and shipping costs before you pay. See the SHIPPING tab on any product page to view the estimated shipping time for various shipping methods. Remember to add to the shipping time how long it takes us to make the leather product before it can be shipped. Shipping time can vary considerably depending on which option is chosen. Q1.4 How much does shipping cost? During the checkout procedure, you will be presented with various shipping options and the shipping costs before you pay. Shipping costs come directly from the post office so the shipping cost is based on the weight of the package and your shipping address. You can also view an estimated shipping cost in Canadian currency at the SHIPPING tab on any product page. Since the post office charges a minimum base weight to start shipping cost on all packages, it often does not cost much more in shipping to add additional items to the parcel since leather products are fairly light in weight. Q1.5 Do you ship to countries other than United States & Canada? In addition to Canada and USA, we ship to Europe and Australia as well as to some Asian and Carribean countries. Since we make our leather products in North America most of our customers are in the U.S.A. and Canada. Q1.6 How are items shipped? We ship our leather products and craft supplies through the post office which has a number of shipping options for you to choose from in regards to affordable cost and speed. However, flammable items have to be shipped by a special way due to shipping regulations. An examples of a flamable item would be Fiebings Professional Oil Dye. Flammable items would be indicated in the product description. Other types of dyes and finishes such as Eco-Flo Leather Dye are not flammable and can be shipped by any postal method. For flammables shipped within Canada, you must choose the shipping option Expedited Parcel. For flammable items shipped to the Continental U.S.A., you must choose the shipping option Xpresspost. Xpresspost is very close in price and delivery time to UPS Standard. UPS is not shown in the shipping options as we rarely use them due to their costlier price. However shipping regulations prevent us from shipping flammable chemicals from Canada Post across the border to the United States Postal Service and require us to ship by UPS Standard. When we recognize the order has a flammable item, we will ship it by UPS Standard but only charge you the Xpresspost cost. We can't ship flammable products overseas. Sometimes if the post office of the customer's country has to collect custom duties, the post office will charge a c.o.d. fee to collect the money on behalf of their government. Q2.1 Can you custom make a leather product that is not in your web store? We can custom make leather products as long as they are not to drastically different than the styles we currently make and use the type of leather we work with. We often make cases for holding objects such as tools, knives or electronics but we require the object to make the case or a wooden form that is the exact size of the object. Sometimes a customer wants a color, design or hardware combination that is not shown and we often can accomodate this if you phone or email to discuss it. However we don't make leather garments such as jackets, pants or vests. Q2.2 Can you imprint a name in a leather product I already own? We can only imprint names and initials in our own products. The hand stamped letters are imprinted before the leather is dyed, oiled, polished and assembled. For foil stamped promotional products we only imprint in our own products as we know which type of our leather and finsishes the foil will adhere to. Where there are so many types of finishes on leather, we don't want to take a chance on a someone else's leather product we are not familiar with. Also with the promotional leather products, we imprint before we assemble the product. Q2.3 The option combination I want is not shown with your product. Can it be made? If this is the case, give us a call or send an email and we will let you know if we can or not as well as any possible price adjustment. Since we make so many custom products to order, we can't list all the possible combinations but often an accomodation can easily be done. Q3.1 How do I measure waist size for ordering a belt that comes with a buckle from Leathersmith Designs? Follow the diagram below to determine your proper belt waist size for your new belt by measuring your old belt from the tip of the buckle to the hole you are using. On the new belt, we will punch the middle hole at this location of the waist size you provide. It is best to measure your old belt and make sure it is pulled out straight when measured. If you do not have an old belt, put a tape measure through your pant loops and make sure the pants are situated at the normal height you would wear them with a belt. Take the waist size measurement that would feel like a comfortable fit so don't pull it too tight. If you cannot measure an old belt, add two inches to your pants size shown on your pant's label and provide the sum for the belt waist size when ordering. However this is not as accurate as measuring your old belt as described below. Q3.2 I want to order a belt but use my own buckle. How do I measure waist size? Follow the diagram below regarding measuring your waist size if you want to have us make a belt to work with your own buckle. Since different buckles are different lengths which will result in different waist sizes, you will have to provide three different measurements for us. When you order your belt, make sure you send us an email with these three measurements mentioning you want to use your own buckle and reference the order number in your email. You can also call in your order if you prefer. When ordering through our website, we don't have the option for using your own buckle so you will have to relay this is information to us through a separate email or phone call immediately so we won't start the belt assuming it is to be made with our buckles. Q3.3 Do your belts have snaps so I can use my own buckle? Most of our belts have snaps on them so you interchange buckles. However our money belts tend to be riveted as well as very narrow belts. Therefore if snaps are necessary, you should call us or send us an email referencing your order number. Please do it immediately after placing the order so we won't finish it incorrectly. If you visit our leather store, we have long plain belts already made in advance in standard widths. We can measure your waist size and attach your buckle while you wait. If your buckle is an odd width, you can order a belt to fit the width required. Q3.4 How much adjustment will there be on my belt? We will punch the middle hole at the waist measurement size you provide. We will then punch 3 holes on each side of the middle hole. The holes are 3/4 inches apart so you will be able to tighten your belt 2 1/4 inches from this middle hole and loosen it 2 1/4 inches from this middle hole. Q4.1 How do I measure neck size for my dog collar? Measure your old dog collar from the tip of the buckle to the hole your dog is using as shown in the diagram below. Double check this neck size measurement by putting a tape measure around the your dogs neck at the looseness worn. You should get the same neck size measurement. We will make this neck size measurement to the middle hole on the new leather dog collar. Q4.2 How much adjustment will there be on my dog collar? We will punch the middle hole at the neck size measurement size you provide. We will then punch 3 holes on each side of the middle hole. The holes are 3/4 inches apart so you will be able to tighten your dog collar 2 1/4 inches from this middle hole and loosen it 2 1/4 inches from this middle hole. Q5.1 Where is Leathersmith Designs Inc. located? We are located at 88 Woodlawn Road, Dartmouth, Nova Scotia, Canada. 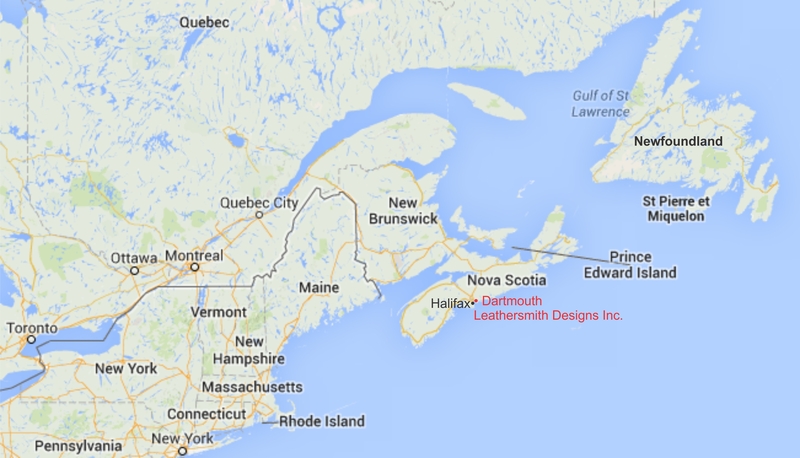 Dartmouth is located across the harbour from Halifax which is the capital of Nova Scotia. Nova Scotia is on the eastern side of Canada where you can enjoy the Atlantic Ocean. You can see on the map that Nova Scotia is just east of Maine, United States. Q5.2 Can I come to your leather shop or is it just mail order? Althouth most of our business is mailing to our customers throughout the world, we have a leather store which you can visit and shop at during our open hours of Monday - Friday, 9am - 5pm Atlantic Standard Time. We are located at 88 Woodlawn Road, Dartmouth, Nova Scotia. Q5.3 What time zone are you in? Our time zone is AST which stands for Atlantic Standard Time. It is one hour earlier than Eastern Standard Time. Q5.4 When are you open? We are open for phone calls and for people to drop into our custom leather shop or to phone us Monday - Friday, 9am - 5pm Atlantic Standard Time. CAD stands for Canadian currency. Our prices default to Canadian currency on the website. However you can change the prices for the whole site to other currency through the currency converter drop down list at the top of the page. These other currency prices are an estimate only for your reference. Q6.2 What currency are the prices shown for the website? All prices on the website default to Canadian currency. You have the option to change all the prices on the website to another currency by selecting another currency in the currency converter drop down menu located at the top of the page. These other currency prices displayed are for your estimated currency price reference only. These displayed currencies are updated daily based on the average exchange rate for the country displayed. If you are in a country that has one of our currency options, your country's IP address may be recognized and the prices on our website may automatically convert and display in your courntry's currency. As previously mentioned, this is an estimated conversion price based on daily exchange rates. Q6.3 What currency is my credit card or paypal account charged? Although prices can be displayed in different currencies, your credit card or paypal will be charged in Canadian currency. Your banking credit card institution or paypal will convert the Canadian currency to your country's currency based on their exchange rates. Exchange rates can vary slightly between banking credit card institutions and throughout the day. Although our currency converter shown on our website is updated daily on average exchange rates, it is for an estimated currency price reference only since it is your own banking credit card institution or paypal that do the actual conversion on your credit card or paypal account. Q7.1 Can I buy your dye to touch up my leather jacket or leather furniture? We do not sell dyes to touch up or redye leather clothing or leather furniture. We only sell dyes for use on undyed vegetable tanned tooling leather. If you use our dyes on leather that is already colored, you will run into problems since there would be finishes on the leather that would resist new dye and end up rubbing off on your clothes. Our leather dye work perfect on undyed vegetable tanned tooling leather. If you think of wood work, our leather dye would be like a wood stain being applied to a new piece of unfinished wood. It would look beautiful and you would see the grains. However if you tried to apply a wood stain to a piece of wood that had been painted, the paint would stop the wood stain from being absorbed into the wood. That is the basic prinicipal with our leather dyes. We don't know where to suggest to get refinishing dyes. Q7.2 How do I measure wrist size for my bracelet? Our wristbands are custom made to the size you provide so please take the time to measure correctly so it will fit you properly. Follow the instructions in the diagram below. We use the wristsize measurement you provide and then we determine how much longer we have to make the leather for overlap etc. Q7.3 Are your products returnable? Since we are a custom shop, products are made to your specifications. Custom made items and imprinted items cannot be returned. For plain stock items and leather craft supplies that have not been used, we will refund the price of the item once we receive it but can not refund the original shipping cost. Also, the expense of shipping to return the item is the responsibility of the customer. We only accept returned items that are shipped through the post office as couriers will charge us a brokerage fee when we receive it if shipped from outside Canada. If it is returned from outside Canada through any other way but though the post office we will not accept it because of extra charges that will be billed to us. When you go to the post office, just ship it by the cheapest slowest way and mark on the custom's sticker "Returning to seller as not acceptable" if you are outside Canada. Let us know when you ship it so we can be expecting it. Q7.4 How accurate are the colors shown on the website? The color of the actual leather product may vary slightly from that which is shown on our website for a number of reasons. Due to the wide range of monitors, monitor color settings, brightness settings etc., the products will display slightly different on a variety of monitors. Also leather is a natural product so each piece of leather absorbs dye slightly different. Some hides may require us to apply more dye or natural oils to make the finished leather item have balanced coloring which results in a slightly darker shade. Q7.5 Quality of materials and craftsmanship? Leathermith Designs has had many decades of experience in crafting leather products since 1975. Training has been acquired by Jamie Hartling's (owner) personal experience as well as training taking through Dartmouth Continuing Education, from other leather craft artisans and from George's Shoe Repair. Training on leather equipment used in the shop required traveling to training sessions in Toronto, Montreal and New York. The other main leather artisan in our leather shop, Alana LeBlanc has a Bachelor of Fine Arts plus many years of practical experience working in the leather trade. Although all our business is now done though online sales and from walk in traffic at out custom leather shop, for 30 years, we traveled the craft show circuit throughout the Maritime Provinces in Canada selling our leather crafts. We attended a variety of show as well as the provincial craft shows organized by the Nova Scotia Deaigner Crafts Council, New Brunswick Crafts Council, Prince Edward Island Crafts Council and the Dartmouth Handcrafters Guild. All these shows required the craft members to pass rigourous quality tests to be able to sell at their shows. These were referred to as juried craft shows since members such as ourselves had to have our work pass the approval of a jury of our artisan peers. We use only genuine leather from higher grade hides for all our leather products. We pay more money to obtain higher end hides from suppliers. Most of our buckle hardware is made of solid brass or chrome plated solid brass. Therefore they are durable, attractive and will not break. We are also a member of the Nova Scotia Better Business Bureau. We have a link near the bottom of our web pages so you can check our good standing as a dependable honest business.